Ollie White has asked the question "Does Danica Deserve An F1 Drive?" on his BlogF1 today. As I mentioned in my comment to the post, this raises all sorts of other considerations (although the direct answer is pretty obvious in my opinion) and I am moved at last to dream a little of the possibilities inherent in an American F1 team. Let it be understood, however, that I still doubt that USF1 will ever happen - the following thoughts are in the "what if..." category therefore. The short answer to Ollie's question has to be no, of course. Danica Patrick has achieved enough in Indy cars to be considered competent and worth her seat in the American formula. But she is also nothing special and that does not bode well for a venture into F1 - it is a different ballgame, as evidenced most recently by Sebastien Bourdais' first year as a driver for Toro Rosso. Sea Bass may come good in his second year but is unlikely ever to enjoy anything like the overwhelming success he had in Champ Cars. Danica does have enormous attraction for sponsors, however, and may be worth taking on for that reason alone. Probably the best thing to do would be to let her have a few test drives in a F1 car and then sign her up if she proves at all capable. That will certainly help with funding but leaves the matter of another driver still open. Most commentators agree that any insistence on American drivers only is a bad idea, especially if it is applied right from the birth of the team. It limits the choice to very few drivers indeed, so parlous is the state of Stateside open wheel racing at the moment. And that is assuming that the drivers concerned would be interested in having a crack at F1, which is doubtful anyway. But, assuming that the team sticks with the plan, it is going to need a driver of existing skills and experience in F1 to assist in development and setting up the car while Miss Patrick smiles for the cameras. That produces a very short list indeed - there is only one driver with the required qualifications and that is my old friend, Scott Speed. Say what you like about him but the fact remains that he is presently the only American who has been there, done the deed and got the T-shirt. Scott has said that he would never go back to F1 but I think he could be persuaded quite easily. He has unfinished business there, after all, and must surely be tempted by a chance to prove all his detractors wrong. His previous problems stemmed mainly from personality clashes with the management of STR and it is unlikely that anything similar would occur in an American team where straight talking is valued rather than considered boorish. So that would be my line-up for the first year of USF1 - Danica for sponsorship and Speed for experience. For the future however, say a couple of years from now, there is a young American driver who has the potential to take F1 by storm. I refer to Alexander Rossi, the guy hobnobbing with Dr Mario Theissen in the photo above. The fact that it is Theissen he's chatting with is significant - Rossi is the reigning Formula BMW Americas Champion and he won the Formula BMW World Final, beating such up-and-coming talents as Esteban Gutierrez and Michael Christensen in the process. Part of the 17-year old Rossi's prize is a test in the BMW F1 car. I watched some of Rossi's races last year and have to say that he is something rather special. His speed is such that the wins seemed inevitable, his performance making the others look ordinary at best. Forget the Andrettis and Rahals - America has talent and its name is Alexander Rossi. Another driver worth a look is Richard Antinucci. He is a nephew of Eddie Cheever's and I saw him in F3 and he looked like the kind of driver who had a chance of a decent career. I would be tempted to give AJ Allmendinger a test, and perhaps Sam Hornish Jr. too. I'm not convinced by Patrick but to be fair to her, there's not really many obviously better candidates out there. And yes, Speed would be a good safe pair of hands if an all-American line-up is sought. If we were to extend the search to the Americas as a whole, there's a couple of really quick looking Mexicans out there. Sergio Perez looked handy in GP2 at the weekend, and Gutierrez must be worth a look in a year or two, to judge by his FBMW performances. Scott and Dinger ain't coming back to open wheel of any form let alone F1. One has a lucrative red bull sponsored Toyota that can contend for wins and let him have a long and successful career while the other just seems to be coming good in stock cars after initial struggles. Why would either of them throw away a steady career with good earnings for a start up team (if it even gets off, that is) whose long term future and competitiveness is questionable at best? Steven: I had a look at Antinucci when I read your suggestion, Steven. He seems to have had a chequered career, moving from one team to another very quickly and only now is beginning to settle into a full series. It is, perhaps, a little early to say but his race wins in Formula 3 Euroseries and a second place at Macau certainly make him worth watching. Patrick: We're largely in agreement then. I think Uppili may be right as regards Allmendinger, however. Uppili: No arguments as regards Allmendinger but I think you could prove to be wrong about Speed, Uppili. His ambition from very young was to race in F1 and he never had a fair shot at it the first time around. In another team and knowing what he now does, it could be a very different story. Scott must be aware of that and it may be a much more attractive proposition to him than you'd guess as a result. He has yet to make a mark in the top flight in NASCAR and so would not be hazarding too much by another go at F1. If I was running the team, I'd go with Scott Speed-Graham Rahal paring, as Speed ain't as bad as most F1 fans think and has some knowlodge from his two seasons at STR and Rahal would be a known name to sell to sponsors and he actually is good outside of an oval (something that can't be said about either Danica or Marco). As for the other ideas suggested, Almendinger would be a good idea, but I doubt he has any interest at leaving Nascar and given that Hornish didn't made any noise about going back to IRL to replace Helio Castroneves, I guess he is very happy at being known just for creating big ones at Nascar (also he wouldn't be an improement a Marco anyway). Antinucci looks like a good propect and so does Rossi. What about RHR? He is out of a ride at least for now, with only Indy 500 being a possible race this year, he seems to have a plenty of time in hand to prepare for a full assault in F1 next year. Limiting themselves to only US drivers is not the best way to go - especially for a start up team with an uphill battle like this one will have. Instead - if the US focus is so important to them - go for drivers who are well known in the US to help build up a following. You'd have then the open wheeler experience, and the marketing power. Franchitti, Briscoe or, dare I say it, Montoya would be good choices. Pink: I'm all for seeing Rubens get a break. I think Alex already has a promising career as President of the FIA if Clive has his way. Filipe: I think you are right. Scott Speed would do well with another shot, and given the right team culture he will excel. Scott has indicated that he views his time in F1 as the pinnacle of his racing career. So I think he would jump at the chance to make his mark (as Clive pointed out). Uppili: Okay, I give up - who is RHR? RHR=Ryan Hunter-Reay from the IRL. And Marc...Clive borrowed the 'unfinished business' line from me two articles ago. Ah, Hunter-Reay, hey? Quite an impressive resume the guy has - definitely a possible for USF1, I'd say. And yes, I borrowed the "unfinished business" line from you, Aracer, for which, thanks. I thought it summed up Scott rather neatly. If they are going for non-Americans I would go with Franchitti and Bourdais. Both well known in the States and both genuinely good drivers. Shame Greg Moore isn't around any more. He could have been ideal for them. But the moron responsible for safety that did clearly didn't understand how to angle a wall so that the driver doesn't die. Bourdais crossed my mind as well. Very popular over here after his stint in Champ Cars. If they go with Non-Americans.....Will Power is very fast on road courses. Also well liked over here in the USA. @ aracerdude - as well, Will Power has THE best name ! He should get a drive on that alone. I really don't think Speed is that bad of a guy, and Peter Windsor has written in support of him many times, so perhaps he has a door open. But first up, I doubt he would walk away from the easy life in NASCAR (after just one race to date) to go back into the F1 pressure-cooker. Second, even if he dosen't deserve it, he's got a bad rep from his time with STR- putitng him in the car would send all the wrong signals. As for Danica, I go back to the sometimes-overused yet always-valid deal on driver records- she's far from good on road courses, and her presence in any F1 team would ignite a firestorm of press coverage that would see the American media pouncing all over the F1 establishment the moment she finishes at the back of the grid. I've said it before, and I will say it again- Jonathan Summerton is your man if you want a young American in F1. He was part of that magical 2006 F3 Euroseries grid that contained many current and future F1 drivers- if Summerton had the backing those guys do, we'd al be talking about him. He's got plenty of road course experience and is ultra-friendly and easy to dela with. Just my opinion- we will see what shakes down later this month. I agree that long term, Rossi looks like a good bet. Personally I think Antinucci is a bit hyped. Not bad but nothing special. Patrick is all fluff but I don't disagree with your reasoning for putting her on the team. I would go with Speed as well if he's willing. I thought he did a competant job during his time in F1. Personally I think one experienced non American would be best for the team. The depth of American talent for F1 is about as deep as a mud puddle. Steven: The main problem with Franchitti would be his age, I think. At 36 he is almost beyond F1 retirement age and would probably not be interested in entering the sport so late in the day. Aracer and Peril: Yeah, Will Power has a great name and is a pretty handy driver too. Thing is, if USF1 extend their search beyond American drivers, the list of potentials becomes very long and that much more difficult for us to guess their choice. What this little exercise does show is the development job ahead of any American team coming into F1 - they not only have to get a car up and running but also begin to extend and deepen F1 experience amongst personnel and drivers in the States. I think it can be done but it will take time. Gman: Don't forget that Speed still has this year to play in NASCAR. If he doesn't improve on the place he gained in this week's Daytona 500 (about 35th, if my memory serves me correctly), he's going to be a bit fed up by the end of the season. Personally, I think he'll do much better than that but so much depends on luck in NASCAR (and Scott's is lousy) that the best he can hope for is respectability. With Danica, you have to weigh her likely performance against her sponsorship value. I think media interest would be just sufficient to compensate for mediocre race finishes. Jonathan Summerton is certainly worth a look. Interestingly, we are finding quite a lot of potential talent amongst American drivers. Perhaps USF1's task will not be as difficult as we supposed at first. 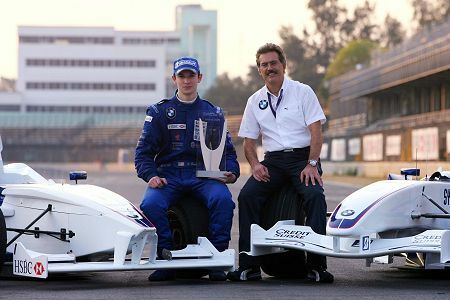 Steve Ellis: Agreed that the best strategy would be to go for an experienced driver, regardless of nationality (someone like Barrichello would be ideal), and a young American with talent and enthusiasm. It remains to be seen how serious USF1 is about their stated driver policy, however. There is American talent available, they just haven't had a stage to show what they can do. The disaster that is known as 'American open wheel racing' has hurt many a career such as Ryan Hunter-Reay's and others. I do believe Josef Newgarten won the Formula Ford Festival this year at Brands Hatch. His team mate Connor Daly also had a good showing. Aracer: Yes, I believe the talent is there but has few opportunities to show itself. If USF1 ever takes off, maybe it will help with rebuilding American interest in open wheel racing. Steven: Hope springs eternal indeed. But I have seen Miss Patrick race on road courses and she seems very competent. I don't really understand where the reputation for "only being good at ovals" comes from. Clive, I suggest you to try to watch her performance at Surfer's Paradise this year. Last season was the first with a good number of road courses in IRL and also thanks to the ChampCar merger the first with a high number of drivers that do better on them, so I'd say it tells us more about her performance then previous years. But I do think it's worth to point out that Andretti-Green whole team seems to have had some difficulties on road courses so maybe the team was having a harder time to make their cars competitive at road courses than the other top teams. Also on her defense (and every other american driver in IRL, BTW), those awful Dallara chassis IRL uses are the same since 2003 when they were still an oval-only category and everyone seems to agree that those things weren't made to drive at road courses and street races, so it's hard to know how she would do in a car that's actually made to turn both sides. Good points, Filipe. But it would be equally true to say that experience only of outdated chassis is another factor working against American drivers. It must be a huge step up to F1 where suddenly you're expected to tell the engineers exactly what the car is doing and suggest ways to improve it. And that is why I think Speed should be on USF1's list - he has the experience needed to help. I agree that its an extra reason for Speed to be at the top of Windsor and Anderson list.